Wyoming is an extremely commerce-friendly state because of its flexible tax code and pro-business jurisdiction, leading many international companies to incorporate there. Wyoming's economy relies on several major industries including agriculture, mining and tourism. Wyoming LLCs and C Corporations will both serve to protect your personal assets in case of business difficulties – your personal wealth cannot be used to clear business debts against your will. Having access to the US banking system makes it easier to do business in several ways. For example, many companies such as Amazon and Paypal will only enter into commercial relationships with you when you have a full US bank account. Incorporating in Wyoming gives you the ability to open an account, even if you’re not a US resident. Becoming an established corporation in Wyoming can have a beneficial impact on how others see your business. Customers will often be more willing to trust you with their details, while other businesses will have more reason to have confidence in you as a profitable and reliable trading partner. Your corporation name is essential to your brand identity. Wyoming requires that all entities incorporated in their jurisdiction have a unique name – we can help you to find one that enhances your identity and brand while complying with Wyoming law. Many businesses find Wyoming highly attractive for incorporation because no taxes are levied on either corporate or personal incomes. Do You Need a Wyoming Address? The state of Wyoming has no requirement for either the company owner or its directors to live within the state, and there is no need for a registered physical address to carry out business activities there. Wyoming C-Corps and LLCs must have a minimum of one member or owner. There are no age restrictions imposed. LLCs must include the names and addresses of its members in the incorporation files, although this is not necessary for C-Corps. LLC names are allowed to end with the terms “Limited Liability Company,” “Limited Company” or the abbreviations “Ltd.,” “Co.,” “LC,” “LLC” and “L.L.C..” However, the word “Trust” is restricted, and any terms implying educational activity needs an approval from the Department of Education. Entrepreneurs looking to form LLC must submit articles of organization to the state. Wyoming-based LLCs are required to submit an annual report on or before the 1st day of the incorporation month. The Articles of Organization must include the name and address of a registered agent who resides in Wyoming, and who is available to manage legal and tax business documentation. For more help with the incorporation filing or registered agent services, feel free to contact Inc. Plan (USA). Wyoming is one of the most tax friendly state. No tax on corporate income or personal income is requested for all types of businesses in the state. Each of the 50 American states has its requirements for incorporating. The essential requirements for C- corporations established in Wyoming are as follow. 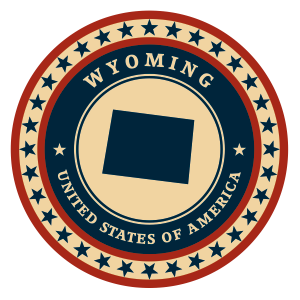 The organization name designations allowed in Wyoming can include the terms “Company,” “Corporation,” “Incorporated” or “Limited,” along with their abbreviations. However, the word “Trust” is restricted, and any terms implying educational activity needs an approval from the Department of Education. In order to form a corporation in Wyoming, entrepreneurs must file articles of incorporation with the state. Entrepreneurs must submit an annual report which is due on or before the 1st day of the incorporation month. The articles of incorporation require a listing of the company’s authorized shares along with their assigned par value. The articles of incorporation must include the name and address of a registered agent with a physical Wyoming address. Any increase in the share number does not affect the initial filing fees. Inc. Plan (USA) can help you with the necessary filings and also with qualified registered agent service.